For some years the CrossFit has become one of the new trends in training, gaining adherents every day. Although the CrossFit has gained popularity in recent years, it has long since practiced. It is a total body workout, based on the methods used by military units and special’s forces. Americans were pioneers in taking this type of military training, later they managed to adapt to the public and patent it as a program with a trademark in 2000. Since then it marks the system has spread and has become one of the trendy methods to get in shape. CrossFit to be taking great popularity around the world has become a very profitable business. Beyond the sport, CrossFit enthusiasts consider it a lifestyle, as part of a community that shares training, nutritional advice, personal slang and even a distinctive style of dress. 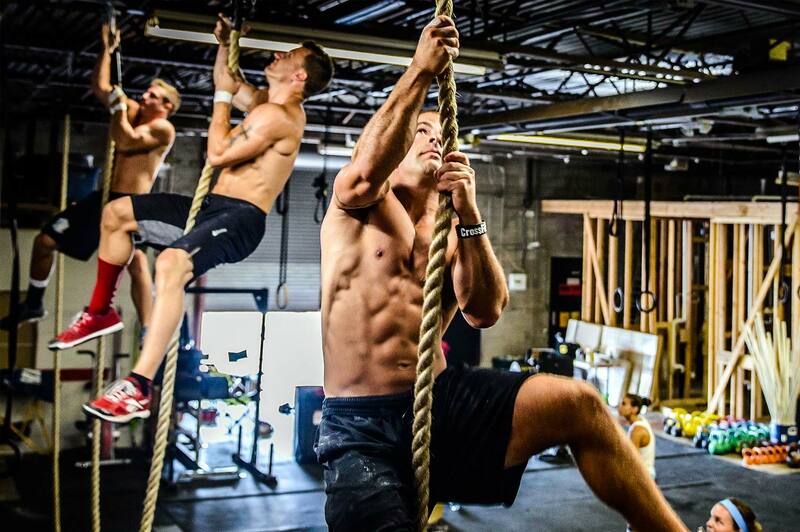 The crossfitters form a group in love with their sport. The main idea of CrossFit is to train the basic physical abilities of the individual through functional exercises. The fact of working movements and muscle chains instead of isolated muscles promotes full and quick workout. During CrossFit sessions working with a very high intensity and reduced time is the key: no session should exceed 50 minutes. Every day makes a Workout of the Day (WOD), which consists of several groups of functional exercises organized as regulated circuit and interval training for a minimum rest. The work of muscle strength of the whole body is a staple in the CrossFit, because it works with high loads and high intensity. It also improves aerobic capacity and other physical skills such as flexibility, coordination and agility. CrossFit sessions are performed in facilities equipped for this training. No machines are used, but other materials such as Olympic barbells, kettlebells, bags with different weights or medicine balls, tires, etc. No mirrors, televisions, treadmills or bicycles. By contrast, there are tractor wheels, hammers, strings, sticks and ropes. The closest to a military camp. In addition, the work often consists of exercises with your own body weight. Some of the most used in the WOD come from weightlifting exercises such as power cleans. Others are more traditional exercises like push-ups, burpees, squats, crunches, pushups load, etc. The most important thing is that during training high work intensity and short duration is performed: are usual rounds and functional multi-joint exercises for 30 second intervals making the largest possible number of repetitions of each movement. Good physical condition to perform CrossFit training is required. It is advisable to have a prior physical preparation, where the person already has ongoing training for a certain time, it is not recommended for someone who will have been sedentary for a season of time or throughout their lives. In CrossFit clases, there are different levels for participants, training can adapt to the physical condition of the Crossfitters. Also, before entering a WOD should make some kind of adaptation in which the technique is taught the basic movements. In the CrossFit many injuries reported due to certain "dangerous movements" which can be avoided with good technique and body control. Each person must be aware of their capabilities and limitations to work them and progress gradually in this training to achieve good performance and avoid injury. The base of CrossFit is always competing against yourself and get overcome every day: while Crossfitters have their own "games" where they compete against each other, self-improvement is the mainstay of this type of training, and encouraging good time to improve. Total Body Conditioning: functional and multi-joint exercises help us train movements involving complete muscle chains, compared with analytical exercises performed on machines at the gym. Diversity and fun: the WOD changes every day, so it is very hard to get bored. In addition, CrossFit training is always done in groups, so the social integration contributes to motivation. Injury prevention: both gain muscle strength as the need for knowledge of the correct technique when performing the exercises helps to prevent possible injury. Adaptation to each individual: for CrossFit training each participant works with the weight he deems appropriate or your own body weight, in addition to working in a certain level lessons. Physical improvements in a short time: by offering a different stimulus to the muscle that is usually subjected, changes occur in a short period of time, especially at first. In addition, high intensity workouts, promotes strength gains and fat loss. It is a complementary training for other disciplines to develop basic physical skills, CrossFit is used as a complement for many different sports, from runners to martial arts. Avoid injury and good physical condition is necessary: for people who have never done sport or take a time without exercise, they must first carry out a physical fitness in the gym, until after a while achieving good physical condition and so that we can start CrossFit training. A recent study evaluated the injuries and the incidence of these to practice Crossfit and these are some of the findings: About 70% of practitioners have been injured during training with CrossFit, of which only 7% need surgery. Intensity control is necessary because it should not exceed the capacity of each person to the extent of risking health. Excessive strain can cause sudden death in people with risk factors or diseases that had not been manifested. Because CrossFit workout is high intensity exercise with short recovery time, increases blood pressure and tension within the arteries of the heart and other cardiovascular system, which can be a risk for people with certain cardiovascular diseases. Special facilities are required for CrossFit, not all gyms have space for this training. People over 35 who have not practiced these exercises for a long time or never in his life, should consider whether it is appropriate exercise, or take it out carefully and low intensity, to be gaining technical and physical condition, and that the more we advance in age, there are more propensity for injuries while practicing intensive technical exercises, and high intensity performance. MNM HOLDING GROUP LLC Headquartered in Miami ,Florida and which is part of a group of companies with a history of 25 years of experience. Brings today a weight loss solution. By clicking this button you accept our terms & conditions.